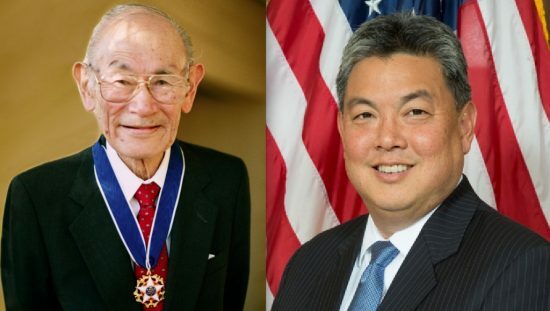 WASHINGTON — On the 73rd anniversary of the Supreme Court’s widely condemned Korematsu decision, which justified the incarceration of that thousands of Japanese Americans during World War II, Sens. Tammy Duckworth (D-Ill.) and Mazie Hirono (D-Hawaii) introduced the Korematsu-Takai Civil Liberties Protection Act of 2017 to prevent similar civil and human rights violations from happening on U.S. soil ever again. Their legislation, also known as S. 2250, is named in honor of the late Rep. Mark Takai (D-Hawaii) for his long-time leadership on this issue prior to his passing. With President Trump’s continued efforts to restrict minority and immigrant rights, the senators said, the bill would help the nation stop repeating history by ensuring that no individual is imprisoned or detained based upon a protected characteristic such as race, ethnicity, religion, gender, gender identity or sexual orientation. Rep. Mark Takano (D-Riverside) introduced companion legislation in the House of Representatives. Takai, who represented Hawaii’s 1st Congressional District, died in July 2016 at the age of 49. In 1942, the lieutenant general of the Army’s Western Command issued Civilian Exclusion Order 34, which directed that all people of Japanese ancestry be removed from designated areas of the West Coast because they were considered a threat to national security. Fred Korematsu (1919-2005) bravely challenged that order. However, on Dec. 18, 1944, the Supreme Court affirmed his conviction in Korematsu v. United States. The Non-Detention Act of 1971 sought to remedy this problem by repudiating the legal framework allowing the government to detain U.S. citizens by deeming them national security risks. However, the Non-Detention Act did not specifically bar detentions or imprisonment based on characteristics such as race or religion. The Korematsu-Takai Civil Liberties Protection Act of 2017 would fix this problem. “‘Stand up for what is right’ is what my father said, and Sen. Duckworth and Sen. Hirono epitomize that call to action by introducing this bill to prohibit the detention of individuals in the U.S. based solely on their actual or perceived protected characteristics,” said Karen Korematsu, founder and executive director of the Fred T. Korematsu Institute in San Francisco. “I am grateful to the senators for introducing this bill on the 73rd anniversary of the Korematsu v. United States decision. At this time of national stress, it is fitting to bring attention to one of the worst U.S. Supreme Court decisions of all times. Even though my father’s federal conviction was vacated in 1983 after it was discovered that the government engaged in extreme misconduct, the original U.S. Supreme Court decision was never overturned — although it has been widely discredited. Co-sponsors of the bill include Sens. Richard Blumenthal (D-Conn.), Cory Booker (D-N.J.), Dianne Feinstein (D-Calif.) and Brian Schatz (D-Hawaii). This legislation is endorsed by following stakeholders: The Korematsu Institute, Stop Repeating History, Asian Pacific American Institute for Congressional Studies, JACL, AAJC and NAPABA.